The 21 Day Fix and 21 Day Fix Extreme are the perfect ways to keep an eye on what you’re eating and help you either lose weight or maintain a healthy weight. I know how difficult it can be to find 21 Day Fix recipes while eating so clean and wanted to pull these together to help you be successful! 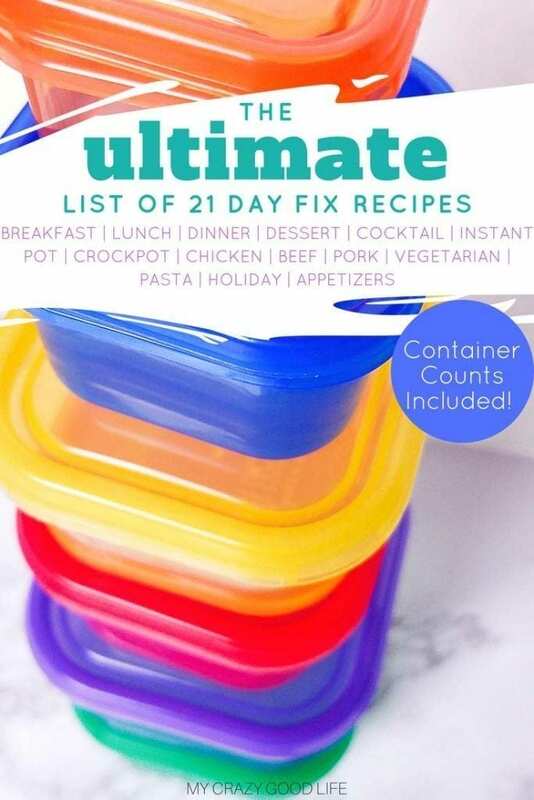 This is a HUGE list of recipes with container counts–don’t be overwhelmed! I’ve made it easier to digest by adding titles to each specific category for you. I’m always pinning the yummy 21 Day Fix recipes I find on Pinterest – follow my 21 Day Fix Recipes, Prep, and Tips board! Definitely one of the more popular categories right now! The Instant Pot is a pressure cooker that can help with quick weeknight meals, meal prep, and so much more. You can saute, pressure cook, and even make yogurt in some Instant Pots. You can read all about the Instant Pot right here, and decide for yourself if you need one :) Don’t be sad if you see something here that you’d like to make, but don’t have an Instant Pot–most of these have alternate cooking instructions for the slow cooker and the stove or oven. Many Instant Pot recipes call for water or broth in the pot, and I have to tell you that chicken broth is a much better choice for dishes with meat in them–like the lunch or dinner recipes below. I have a recipe here for how to make bone broth and it’s so easy. Fajita Breakfast Casserole This can be made in a slow cooker or in the oven, as well. It’s a great meal for the 21 Day Fix or even 80 Day Obsession. You can easily add lean breakfast meats to this if you feel it needs more protein. Apple Cinnamon Oatmeal Cups These are seriously delicious, and kind of taste like a cheat–but they’re not! It’s a baked oatmeal, so it’s heartier than traditional oatmeal. I personally don’t care for oatmeal, but love these–give them a try! Mini Frittatas I love how easy these are to customize! Sometimes we add bacon in, sometimes tomatoes–these are a perfect meal prep breakfast. Copycat Starbucks Egg Bites Hands down, the most popular breakfast recipe on my site–these are so easy to grab-and-go on busy mornings, and super easy to customize with your favorite additions! Blueberry Lemon Zest Steel Cut Oatmeal Fresh flavors make this easy to make breakfast a favorite of many. Swap out the berries with others, or add more if you like! Buffalo Chicken Bites Craving wings? These buffalo chicken bites are so yummy, and totally help with the wing cravings! Mini-Meatloaves These are so easy to make ahead of time and pack in a quick lunch. They’re delicious, and easy to pair with cooked or fresh veggies. Chicken Burrito Bowl Dry rice and beans cooked along with frozen chicken make this one of the easiest meals to make in the Instant Pot–pretty much no prep time required! Chipotle Chicken Marinade Use this delicious marinade to spice up your meal prep chicken for the week! Crack Chicken This recipe can be eaten by itself, in a sandwich, on top of cucumbers or mini peppers, or even on top of a salad. Buffalo Chicken Dip A similar recipe to Crack Chicken, this is *my* favorite recipe! I love using this as a veggie dip. The recipe makes a ton, and it can easily be portioned out and frozen for later. Egg Salad No, egg salad doesn’t have to be made in the Instant Pot, but man does it make it easier! Crack your eggs, cook them up and make a delicious sandwich or salad topping! Rotisserie Chicken Soup with Salsa Sooo easy for a quick lunch. The kids love it, and with or without cheese, this will fix your craving for salsa! Spinach Artichoke Dip This could definitely be a dip, but I think its makes a great lunch as well! Add to veggies or on top of a salad. Macaroni and Cheese A fixed mac & cheese with veggies and whole wheat pasta–and it’s passed the kid test! Your entire family will love this meal. Cloud Bread with Greek Yogurt I love this recipe! I make them to snack on, usually, but cloud bread can also double as sandwich bread, mini pizzas, and more–they’re delicious and light. Goulash We make this once a week, and add whatever veggies are in the fridge! I love using my food processor to “hide” extra veggies in it, as well. This dish freezes well and is perfect for meal prep! Beef Stroganoff So filling and delicious! I love pairing this with a big plate of fresh veggies. Lasagna If you don’t have a springform pan, you can make this right in your pot liner with 1/2 cup of water. It’s delicious and there are never leftovers in my house! Beef Fajita Bowls with Quinoa Seriously delicious–this easy to customize meal prep dinner will please your entire family! Spice it up with some jalapeños or keep it simple for the kids. Enchilada Bake Green chilies make this a delicious and slightly spicy dinner recipe. I love adding it to the top of a salad, and my husband puts it in tortillas. Either way, it’s delicious! Vegan Quinoa Tacos These are so flavorful! Vegan Quinoa Tacos are a light meal that is perfect for summertime. BBQ Meatloaf Bombs We love to make these when we are entertaining! Guests are usually wowed by the presentation of these, but they have no idea how easy they are to make. On nights when we are rushed for time, I diced the onions and add them into the meatloaf mix. Spaghetti A family favorite–fixed! Seriously easy in the Instant Pot, and you can use jarred or homemade sauce (link for sauce provided!). Mushroom Risotto It looks and sounds so decadent, but it’s a pretty easy recipe to make! I love making this as a side with grilled chicken and veggies! If you don’t like mushrooms, you can easily sub another veggie. Pad Thai It’s pretty easy, and soooo delicious!! You’re going to love this dish, whether you choose to add chicken or tofu to it! Beef Pho No, this isn’t the quickest recipe–but if you’ve got a craving for Pho, it’s a Fixed version for you! It’s worth the wait–really. Spanish Cauliflower Rice with Chicken This is such an easy and delicious dish–perfect when you’re craving some Mexican food! Orange Chicken Craving Chinese food? This orange chicken will hit the spot, and the entire family will love it! Pair it with brown rice, fresh veggies (raw or cooked), and you’ve got yourself the perfect meal. Swedish Meatballs This recipe has had nothing but rave reviews–for good reason! It’s not super fast, so this might be best on a weekend when you have time to roll and saute the meatballs. Some have chosen to not form the meatballs and use the sauce and meat on top of wheat noodles instead! Spicy Sweet Potato Chili Do you love spicy? This chili recipe is just for you–it’s a family favorite! Stuffed Pepper Soup This is a hearty soup–almost like chili. It’s easy to make and is so satisfying. You can easily add extra peppers or other veggies, just be sure to count it with your containers! 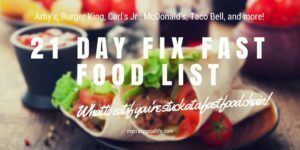 If you’re wanting a specific meal plan based on your likes or calorie bracket, here is a huge list of 21 Day Fix Meal Plans for you. Cupcakes You could definitely eat these for breakfast without much guilt! These Instant Pot cupcakes are delicious! Healthy Cheesecake Recipe This recipe has been tested and approved by so many Fixers! It’s delicious, and so very easy to make. Don’t worry about the springform pan unless you’re wanting it to be beautiful–this can easily be made right in the pot. Lava Cake Not even joking–there is a Fixed lava cake and it’s delicious!! I love adding a teaspoon of peanut butter to it–right in the middle. Brownies Though I have to admit that I like the texture of oven cooked brownies better, it’s kind of fun to bake in the Instant Pot! Looking for more? Here are even more Instant Pot and Pressure Cooker recipes for the 21 Day Fix! Flour Free Pancakes Seriously delicious pancakes–you don’t have to give them up because you’re watching what you eat! Sweet Homemade Sausage You can make this with ground turkey or chicken, and it makes a delicious addition to your morning! These are super easy to prep on the weekend and eat all week long. This is one of my favorite 21 Day Fix recipes to prep ahead. Savory Homemade Sausage If you’re not a sweet breakfast sausage person, this savory version is the one you’ll want to make. It’s equally as delicious and easy to make. Sweet Potato Hash I love making a big batch of this and freezing it! It pairs perfectly with the sweet or savory homemade sausage, and I’ve been known to crack an egg over it while it’s reheating on the stove. Breakfast Fried Rice I can’t even express how exciting this recipe is for us. We make it when we go down to Mexico, when we went on our RV trip, when we know we will have a busy week coming up. It actually gets better after the first day too–though, you’re not even going to believe it because it is SO good the first day! 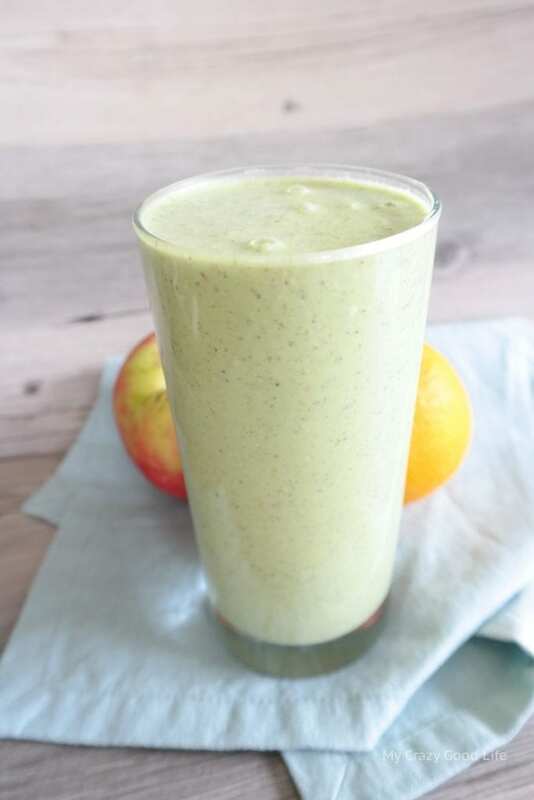 Green Smoothie This is a delicious green smoothie recipe that you will want to make again and again–promise! Tacos in a Bell Pepper I’ll never eat tacos the same way again! I love that the flavors come out in this recipe, and the bell pepper is the perfect addition to the tacos! I prefer red bell peppers, but any color would be just fine! Mini Zucchini Pizzas I’m all about mini anything for lunches! It’s much easier for me to sit and the computer and work when I have something that is easy to snack on for lunch. Philly Cheesesteak Stuffed Peppers Such an easy and delicious recipe–my entire family loves them! Baked Carrot Fries Easily as yummy as the sweet potato fries, but these count as a green! Pulled Pork with Maple BBQ Sauce A huge favorite around here, this recipe is super simple and I have to double it if I want enough for lunches for the week. Spinach and Cheese Stuffed Chicken Roll Ups This recipe looks amazing! It seems much more difficult than it actually is, and will definitely impress everyone at your dinner table. Chicken Couscous Lemon Wrap Such an easy lunch, with nice and light flavors. A yummy 21 day fix recipe! Chicken Salad This is a great topping for or you can make a sandwich out of it. I love it on raw veggies, like cucumbers or peppers! Crab Cakes I love making these for guests–they always assume it’s a difficult recipe to make, and it’s not! The sweet potato makes these pretty hearty, too. Egg Roll in a Bowl This is such an easy recipe, and so delicious! Your entire family will love it. Chicken Enchiladas These look delicious, and could easily be a quick weeknight meal! Sheet Pan Fajitas I love being able to add everything to one dish and cook it, like with these sheet pan fajitas. Easy to make, easy to eat. Taco Skillet with Ground Beef So easy to make, and super delicious! This recipe pleases everyone at the table, and I love that it only calls for one pan! Steak Fajita Zoodles This recipe is one that we make weekly, especially during the summer when we are grilling a lot! It’s easy to swap out the veggies for ones that you have in the fridge! Pork Chops with Goat Cheese Butter Nancylynn has a way of making any recipe super easy and delicious. These pork chops are simply amazing! Meatza or Meat Pizza The “crust” for this pizza is meat–it’s super filling and gets rid of your pizza craving! My entire family loves this recipe, and you can customize it with all of your favorite toppings! Let’s talk about Wonder Whip recipes! There are so many, seriously a ton (in this post right here). There’s a mint chocolate one that’s to die for and of course chocolate peanut butter! I also have a lemon meringue variety and a key lime pie for the citrus lovers out there! Blender Donuts These are so easy to make, and such a fun treat! I don’t normally start my day with a treat swap, but these are perfect for birthday and holiday celebrations! Pumpkin Spiced Apples It will definitely feel like Fall is in the air when you make these spiced apples! They’re delicious, and can also be made in the air fryer if you have one. Margarita Sorbet with Tequila Pretty much the most “worth it” treat swap you’ll ever have, if I can share my opinion about it. Sweet sorbet and a shot of tequila make this treat the perfect poolside companion. Coffee Ice Cream (made with bananas) This is so easy to make, and I love making several servings and freezing them for later. Chocolate Ice Cream (made with bananas) If you’re a chocolate lover, you might love this ice cream instead of the coffee one above. Hmmm.. or maybe you can combine the two flavors!! Banana Oatmeal Chocolate Chip Cookies These are the best to have made when you’re craving sweets. They’re hearty and filling, but not too bad for you. I need to make them in small batches, or my entire family eats these non-stop for days! Because of the alcohol in these 21 day fix recipes, they’re considered a treat swap. If you make them without alcohol, the sparkling water is free! Using the slow cooker to make sure that you have a healthy dinner waiting for you when you walk in the door at night is sometimes the only thing that keeps us on track, right? I love using my crockpot to cook meals on busy days. It helps me stay focused on my goals first thing in the morning when I add everything to the slow cooker! Crockpot Pork Carnitas (can easily be swapped for beef!) These are so delicious, and a little bit spicy! Quinoa Tacos Whether you’re having a meatless Monday or just craving quinoa, these are yummy! Chicken Fajitas So easy to drop in the crockpot in the morning and eat when you get home. And these make the house smell wonderful! Homemade Tuna Casserole This was a favorite of mine growing up, and my kids ask for it all the time. Here’s your Grandma’s classic tuna casserole, but Fixed! I love serving it as a side with a bowl of soup or roasted veggies. Egg Salad I know you don’t cook egg salad, but you can cook your eggs in the slow cooker soooo easily. Pot Roast This is a cold weather family favorite, for sure. I love that we found a way to make it healthier with homemade onion soup mix and cream of mushroom soup. Crockpot Chicken for Meal Prep It’s so easy to stick this in the crockpot while you’re meal prepping and then use the chicken all week long for lunches and dinners. Pizza Stuffed Peppers Another way to curb that pizza craving! Add your favorite topping and stick these in the crockpot for lunch or dinner. Healthy Spinach Artichoke Dip Seriously creamy and delicious as a snack, topping for a salad, or on top of pasta as a meal! Blueberry Lemon-Zest Steel Cut Oats Yes, these are the same oats as the Instant Pot recipe above. There are instructions for Instant Pot, slow cooker, and stove top versions. Feel free to get creative with the fruits and spices you add to this dish! Enchilada Bake I love making this and using it for lunches all week! It’s so easy, and such a delicious salad topping. Crockpot Turkey Chili Can you say YUM? This turkey chili is so yummy, and of course you can swap the turkey out for any lean meat that you have on hand! Ranch Pork Tenderloin People in our Facebook support group RAVE over this recipe. That ranch taste you love in a healthy and filling crockpot recipe. Salsa Verde Pork I love using fresh green chilies in this recipe, and then using the meat in burritos, tacos, or as a salad topping! Breakfast Casserole with Fajita Veggies This is great for any time of the day, not just breakfast! I love making it as a “lazy” dinner. Beef Stroganoff A comforting favorite made super simple in the slow cooker! I love eating this on top of zucchini noodles. Turkey Breast Simple and delicious, I love this easy and healthy dinner recipe. Chicken Salad using Crock Pot Chicken I love prepping chicken to use later in the week, and this is such an easy recipe. Mini BBQ Meatball Bombs I love making these! If you want to be lazy, you could cut up the onion and add it to the meatball mix. Healthy Spinach Artichoke Dip I love making this for company and using it as a dip or even a salad topping! Stuffed Pepper Soup I love this in the winter, but we eat it in the summer too–we just bring the slow cooker outside! Beef Fajita Bowls Easy for everyone to customize their own–the kids love making these! We make these a lot of the weekends to eat during the week. Healthier Cracked Out Chicken I can’t believe how much you all love this recipe! It’s that cheesy, bacon-y, ranch-y internet sensation made healthier. You can use it as a salad topping, the filling for a sandwich, or even eat it by itself! The possibilities are endless. Mini Meatloaves in the slow cooker I love adding these to my to go lunches! They’re easy to eat and super easy to make. My kids ask for them at least once a week. Being dairy free doesn’t mean you have to suffer through the Fix. 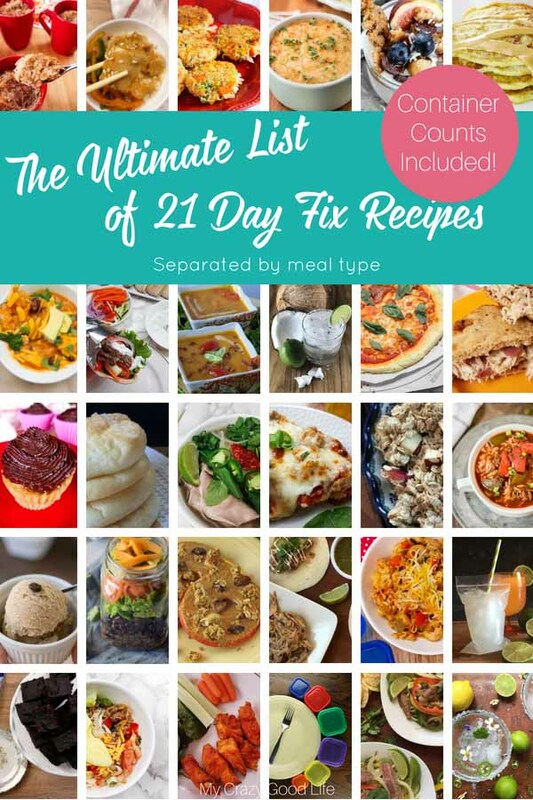 These are some of the most popular dairy free 21 day fix recipes including including coffee ice cream, meatloaf, and breakfast cookies. Cinnamon Bun French Toast Cups Ok, we’re starting off on a sweet note but seriously–do these not look amazing?? Veggie Pancakes You can serve these with no worries–they’re a healthy and delicious breakfast option! Steak Fajita Zoodles This is one of our favorite family meals–we make it several times a week during the summer with different variations of meats and vegetables. Lemon Garlic Chicken Sheet Pan Dinner So easy and delicious–and seriously who doesn’t love a one pan dinner? Beef Bolognese with Spaghetti Squash This is definitely one of my favorites! I never feel like I’m missing out on pasta when I eat spaghetti squash with red sauce. Butternut Squash Soup So comforting and delicious–and easy to make dairy free. Asian Stuffed Peppers I love this take on a traditional stuffed pepper recipe! Almond Crusted Chicken This is a recipe that I never would have created on my own, and it sounds amazing!! Pork Carnitas Directions for both the slow cooker and Instant Pot are included, and this is definitely one of our family’s favorites! Avocado Chicken Salad This looks amazing and delicious. Perfect for a warm day, for sure! Basil and Peach Pork Chops Such fresh flavors in this one! Another great summer recipe. Bean Dip A great happy hour option! Click here for the full post: Chicken recipes including hummus crusted chicken, BBQ chicken salad, Greek grilled chicken, and these super easy burrito bowls. I love the variety with these, because let’s be honest–chicken can get a little boring. Skinny Saag Chicken People in our Facebook groups rave about this chicken! Serve it when company comes and I bet you they’ll have no idea it’s healthy. Healthy Crack Chicken This is another chicken recipe that people go crazy for. You can make this and eat it as a dip or use it as a sandwich filling. Some people love filling mini bell peppers with it, and some have used just the dressing from it as a dip for vegetables. Buffalo Chicken Chili There is no reason to crave buffalo wings with all of the amazing healthy buffalo recipes out there! This buffalo chicken chili is so delicious, and it’s perfect for happy hour. Cheddar and Broccoli Stuffed Chicken I haven’t tried this one yet, but it looks amazing! I bet my family will love it. Buffalo Chicken Mac and Cheese Seriously with the buffalo flavors, right?? You can make this in the Instant Pot, crock pot, or on the stove. These healthy dessert recipes are just the thing to kick that sweet tooth! Treat Swap Protein Balls My entire family loves this recipe, and I have to make it only every once in a while because they are so addicting! Easy to customize too! Strawberry Shortcake Martini Stephanie has a knack for making everything she touches beautiful. You could definitely serve this to anyone who enters your home! Coffee Ice Cream with bananas is a great way to get that creamy flavor that you’re craving without the calories and fat in ice cream. Strawberry Banana Dairy Free Ice Cream Again, delicious flavors and low on calories. It’s the perfect summer treat. Chocolate Covered Bacon is so great for a chocolate treat when the cravings strike! Strawberry Rhubarb Crisp Anything that ends with “crisp” is going to be a favorite of mine! Savory Wonder Whip recipes are amazing for dipping veggies, chips, and more. These are some great 21 Day Fix dips for snacking that you have to try! Looking for all of the posts I’ve pulled together on this topic? Here is my 21 Day Fix Snack post! Bell Pepper Nachos The perfect blend of veggie and protein for those snack attacks! Secret Ingredients Queso Dip and tortilla chips to dip! Baked Zucchini Chips I’m dying to try these with my garden zucchini later this summer! Oatmeal Energy Clusters In my opinion, the best use of a treat swap there ever was! 21 Day Fix Breakfast Recipes including apple cinnamon oatmeal, french toast wrap, and stuffed protein crepes. Two Ingredient Banana Pancakes This is an every other day staple in our house! I love starting my day with them. Cheddar and Chive Savory Waffles Not a morning sweet person? This breakfast recipe is perfect! Sweet Potato Hash We LOVE this! I make it and freeze it, then pull out a bag to eat all week long. Flour Free Pancakes Soooo delicious, and perfect for company! Is there a 21 Day Fix Vegetarian Plan? There isn’t a specific plan for vegetarians on the 21 Day Fix, so we have found that they struggle a little more with meal choices. These 21 Day Fix Vegetarian Recipes should help! If you’re looking to learn more from the brains behind the 21 Day Fix, here’s an interesting Q&A with Autumn Calabrese! I love using zucchini noodles to get all of my greens in for the day! These are some of my favorite 21 Day Fix Zoodles Recipes (click this link for more recipes, or see a sample of them below!). Zoodles and Veggies This vegetarian meal is easy and delicious! Chicken Pad Thai Zoodles My entire family loves this one, it’s so easy! Steak Fajita Zoodles I have this at least weekly during the summer! We use whatever veggies we have on hand. Chicken Zoodle Stir Fry Super easy and again, easy to customize! Skillet Zoodle Lasagna For those nights what you’re craving lasagna, but short on time. Zoodles with Turkey Meat Sauce This completely stomps out my spaghetti craving! Whether you buy Shakeology or another protein powder, these shake recipes will keep you from getting bored! If you love protein shakes and Shakeology, you’re going to love these Shakeology snack recipes! If you’re looking for specific flavor recipes, here are my posts for Cafe Latte Shakeology, Chocolate Shakeology, and Vanilla Shakeology recipes. Looking for 21 Day Fix Chili Recipes? These are delicious, and SO different from one another–you definitely won’t get bored. Spicy Chipotle Chili A little spicy and so easy in the Instant Pot! Sweet Potato Black Bean Chili This is another favorite–definitely good if you need some help with those yellow containers. Crockpot Turkey Chili This staple chili recipe is one of our favorites! Beanless Beef Chili I’m all about this chili recipe, I love the extra veggies in it. Buffalo Chicken Chili This one is so yummy!! I’m a big fan of buffalo anything, so this is a natural choice for me! Good luck on your weight loss and maintenance journey! Cool list! I am not on the 21 day fix, but can appreciate the recipes. Thanks for sharing! Great list of healthy things to eat. I am not currently on the 21 day fix, but I am trying to lose weight and this is a great start. I appreciate you taking the time to put the info together for the rest of us. You rock for sharing with everybody! Thank you so much for all this extra information and recipes. I mistakenly ordered the extreme when in reality I wanted the essential but I am going to give it a try instead of returning. Again, thank you. Where are the lunch recipes? I don’t see that category… Thanks! Amazing article! 21 Day Fix is my most favorite workout program from Beachbody. Just bought the 21 day fix and the tools you share are extremely helpful. Thank you for sharing your content, love it and love your site! My mistakenly ordered the extreme when in reality I wanted the essential but I am going to give it a try instead of returning. Again, thank you. 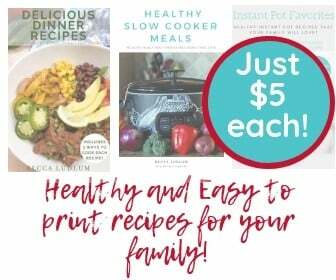 Are your recipes from the fix and fixate cookbooks? If not how are they fix approved to stay on track. My recipes are made with Fix-approved ingredients.